You know what is funny? When Brayden was McKenna’s age, I thought he was so old. He had lived a long life. I still think of McKenna as a newborn! And here she is, 5.5 months old! NIGHTTIME SLEEPI continued to wake McKenna at 8:00 AM each morning. This week, I introduced McKenna to carrots (remember, you aren’t supposed to feed homemade carrots to a baby under the age of 7 months. I fed her store-bought carrots). She loved them. I also finished out my two month supply of peaches. Peaches have grown on her, and she loves peaches and oatmeal mixed together. I am really excited because my husband’s grandparents grow butternut squash. Squash is not a hot commodity, so they will be giving us all of their extra. Squash freezes for two months in the cube method and stores for two months in a dark, cool place. We will have all the squash she can eat! I told my husband that making babyfood is very inexpensive, and when it is free, it is a lot cheaper than buying it! So far, the only food I have had to buy to make for her is bananas. Everything else is coming out of our garden or my husband’s grandparent’s garden. We still have had no rolling interference with naps. Knock on wood. We started moving the dreamfeed back in preparation to drop it. At first, I was doing 5 minutes. Then I decided to take it in ten minute increments. What kind of oatmeal are you feeding McKenna? Also, are you giving McKenna a full feeding of breastmilk before feeding her oatmeal, fruits and veggies?Thanks. Right now, I am feeding her Gerber oatmeal. I plan to start the cereal you make outlined in super baby food, but you can't give that until 6 or 7 months. Oh, and I am feeding her a full feeding of breastfeeding before solids. Why is it that you cannot feed a baby homemade carrots until 7 months? I do have Super Baby Food but I also have another cookbook and it has carrots as a good veggie to start with as a first puree. I made a batch the other night and they are in the freezer but I have held off because he has been constipated for a couple of days and I read to steer clear of bananas, carrots, and apples to help with that. My William is also 5.5 months and so far he has just had cereal, sweet potatoes, and pears. I did give him some bananas the other day (just once)and he has been constipated for 4 days now. I am waiting on a call from the nurse right now but if you have any great ideas on how to relieve that let me know.I have continued with fruits and veggies as well as some pear juice. I am going to try some prune juice in a bit. He is beginning to get very uncomfortable. On a different note, I have written comments before on his chronic 45 minute naps. I am happy to report that as his "morning nap" is developing, his 45 minute naps are becoming a thing of the past. He still takes 2 45 minute naps in the afternoon but his 9:00 am nap is getting longer. Hopefully within the next couple of months he will develop a good afternoon nap. Anna, carrots (and other root veggies) can have nitrates in the soil. If so, this can cause anemia in a baby younger than 7 months old. Carrots are fine for a baby under 7 months, but the nitrates can be dangerous. Baby food makers can afford and do test their soil for nitrates. Super Baby food says to not even feed homegrown carrots because you don't know if there are nitrates in the soil or not. I have a whole lot of carrots sitting in my garden waiting for me to cook them up for McKenna :)Yaron says that not all doctors agree that there is any real risk involved. 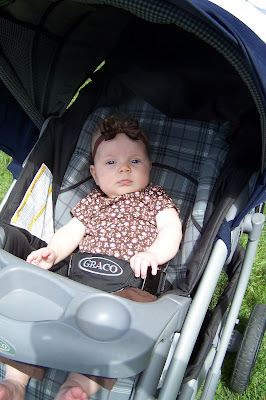 Babywise II (the new one) mentions nitrates and carrots also. I am a type who is better safe than sorry, so I will be waiting until she is 7 months old. I will start making them soon, but freeze them. Oliver is almost 16 weeks, and I think he is an old man!! =) I remember feeling like months 1-3 drug on foooorrrrreeeeevvvvveeeer…but now I'm like, "Slow down, son!" I read that about carrots too, but my Botanist friend said that ALL soil has nitrates in it. It's something that makes soil what it is. Causes some process to happen that makes plants grow??? What causes a problem is that the chemicals that are sprayed on most carrots increase the amount of nitrates in them.I read in the 100 top baby purees (I think that's the title, but I lent the book to a friend) that you can buy organic carrots to make for your baby from 4 months on. It was one of the first foods I gave to my LO! Her iron levels have always been fine. Not that that's proof of anything, but I thought I'd throw that out there! Making babyfood is fun and easy! I made zucchini and summer squash the other day and froze it. Also, I have made sweet potatoes and carrots. I am buying the commercial baby food for fruits though. It seems like too much trouble to prepare those, except for bananas which my DD hates! !The website wholesomebabyfood.com also has some great recipes for seasoning the food. I am going to try some of those soon. Valerie, I mentioned in another post the little amount of solids my DD was eating (way less than McKenna) and my DD will be 8 months old next week. I called my ped who said that if she is eating only 1 jar or less of babyfood a day (which she is), then I will need to cut back her formula intake to about 24 oz to get her to eat more solids. Right now she is taking in about 28 oz of formula per day. Just FYI for you and anybody else who has babies with very small appetites! This question doesn't pertain to baby food, but wasn't sure where else to leave it. My second girl is 4 1/2 months old and I'm nursing. She still eats about every three hours. I can't seem to strech to a 4 hours schedule because of her naps. She is consistently waking up after 45 minutes for every nap, which means that she is always up before it's time to eat again. In the evening I will feed her at about 7:30 and she will sleep until 5 or 5:30, eat and go back to sleep until 7. With our first, she was an awesome napper and I'm just not sure what is going wrong this time. It's very frustrating. I've tried letting her cry for 15-20 minutes, then going to check on her and put her back down. She's only gone back to sleep once with that method. Do I just let her continue to cry it out and she'll eventually catch on? I guess I'm just needing a little encouragement and advice. Thanks for all your time and the great blog! Thanks for keeping up with the weekly baby updates, I really enjoy them! The Gwins, I have a 5 month old and he is still a 45 minute napper. I feel the same way about a 4 hour schedule. He sleeps great at night 8pm-7am, but naps are another story. The Gwins,My DD is a chronic 45 min napper. She started at about 2.5 months of age and is now 8 months old. In the beginning, I let her CIO at the transition (obviously, I troubleshooted hunger, etc first!). She would cry and/or fuss for 30-45 minutes. Then over time she learned to soothe herself back to sleep. Now that she is older, when she wakes at 45 minutes, she is very happy and content and plays in her crib until "naptime" is over. That is how I did it. Other people try getting the baby up and putting them in the swing, etc to finish out the nap. The main goal is teaching them to either sleep (this is the preferred option!) for the whole naptime, or remain happy and content for the duration of naptime. It is a training process. Most babies grow out of this 45 min nap phase in a few weeks or so. Be sure you are doing everything you can to promote good naps: optimal waketime length, block out outside noises, light, appropriate wind down, and of course making sure baby is getting enough calories! In the end, some babies just aren't great nappers and we just have to accept it. Team OSM, I feel the exact same way! Gwins,It might be a four month old issue. Four months is a difficult time for all babies, not just BW babies. And it is a common time for the 45 minute intruder.The first thing to do is to get her up and feed her. It might be a growth spurt. If so, feeding her more often will give her the extra food she needs.I would try that for a week (unless it stops sooner than that). If no improvement, then move on to other possibilities. Hey Val—Thank you for your posts! My daughter is 24 weeks old and for a while now I was wondering if she was pushing herself towards a 4 hour schedule. Now I'm sure of it. Our schedule just recently transitioned itself to this: 7:00 – wake, nurse, 2 T oatmeal, 2 T fruit8:30 – nap11:00 – nurse (bottle)12:30 – nap2:30 – nurse (bottle)4:00 – nap5:30 – nurse, 2 T oatmeal, 2 T veggies6:30 – bath, bottle, bed by 7 or 7:30Here is my problem—my daughter has been a chronic 45 min napper since she was 2 months old. We've tried everything, and only recently has she started to squeeze in about one 1.5 hour nap a day—usually the morning nap…We're getting better. However, she is showing ALL signs of being ready for a 4 hour schedule…She has been sleeping 12hours consistently since 15 weeks old.So…do I let her transition slowly, or do I just bite the bullet and do it one day? Another problem/question (and I know that you primarily nurse) is that Jordyn gets 3-4 bottles a day. She is breastfed for her 7 am feeding, but I work full time and she is with my MIL for her 11-2-5 feedings, and she has always received a formula bottle for her last feeding since she was 5 weeks old. So, my confusion is with the amounts of milk. I've done a milk calculator, but it just seems like sooo much! If she transitions to 4 feedings a day, it's roughly 8.5 oz. per bottle!If anyone has any tips, I would greatly appreciate it! She has shown that she can comfortably eat 8 oz. at a sitting, but I just want to make sure she is getting everything she needs! Dawn,Some babies are more of natural sleepers than others 🙂 She is a big sleeper. I suggest you first see the post: 5-8 month sleep disruptions and see if any of those items apply. Lindsay, one of the signs for a four hour schedule is having to be woken from every nap. But many moms find that when they move to a four hour schedule, naps get longer. You can definitely try it and see how it goes. If it doesn't go well, you can always go back.I really don't have any knowledge about ounces per day until 12 months. The Yahoo! Chronicles group has moms who bottlefeed, so you might find answers there. just want to say thank you for posting the weekly summaries. they're such a tremendous help! my little girl is about 5.5 months old. i'm still feeding about every 3 hours and squeezing in 6 feeds a day. i know that i need to change it up a bit because she doesn't need that many feeds, but she's my first and it's so darn fun to nurse. i don't plan to intro solids until 7 months so hopefully i can skip the puree phase completely. thanks again! Sarah,treat it like a time change. See my posts on time change for information on how to do that. Good luck!